Mom Taxi Julie: Random Friday! I'm never riding the bus EVER. Can you imagine sitting on that bus while this was happening. Talk about freaking scary! On a brighter side, I finished the book I was reading this morning. 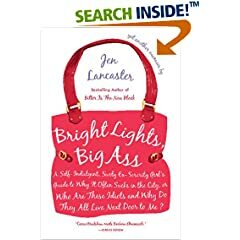 By blogger Jen Lancaster. She is too funny! In other news, we were SUPPOSED to go meet up with a friend of mine today and go to the park that has the water that shoots out of the ground for the kids to play in and have lunch, BUT my son woke up with a croup cough. So guess we'll be staying home today. I am going to have to run to the little corner store however, since apparently 2 gallons of milk are only enough to make it 2 days, not a whole week. I knew buying that chocolate syrup was going to make them use up all the milk faster! No more chocolate syrup. That stuff is the devil anyways, and I prefer Ovaltine anyway! So now to figure out what I'm going to do today. I'm thinking of maybe breaking out the scrapbook stuff OR working on these pictures I need to scan some more. I did a few more yesterday. Things I like about this picture. 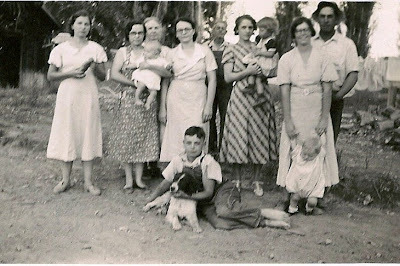 1) That's my great grandma in the stripy dress holding my grandma. 3) The dog. There are almost always dogs or cats in our family pictures. 4) I don't know who the other people are but they all look like they are happy even though it looks like there is lots of dirt. 6) The babies, aren't they cute? That is a fantastic picture! I love old photographs, especially when they contain pictures of family members you have not even met. The old family picture is fantastic, and I love YOUR thoughts on it. We used to go through So much milk here, too. A gallon a day. I couldn't even stock up for week if I wanted to because I didn't have room! LOve the picture... I'm confused, what happened on the bus? Maybe that guy didn't like how the other guy was sleeping? Maybe he SNORED OR FARTED... sinful! Dreadful man, I hope he gets locked up for life! Lovely old photos... yes the babies are adorable... show me one that isn't!